Avaaz are taking Ofcom to court after they gave Fox News a clear bill of health - despite the company being ridden with scandal. Things are not going well for Murdoch’s bid to take over Sky. In June last year, Ofcom declared that a Fox News-owned Sky would be ‘fit and proper’ to run a broadcaster in the UK. The Murdoch family – which control Fox – thought it would give them a clear run. But a series of scandals in the US have brought it into doubt. Last month, Murdoch’s Fox News ran a story that a senior Democratic National Committee staffer, who was shot dead in July, was the source of the WikiLeaks documents on Hilary Clinton during the Presidential election. It turned out to be a hard-right conspiracy theory – arguably the tip of the iceberg in terms of fake news at Fox. So after huge pressure and legal threats from campaigners, Culture Secretary Karen Bradley referred the bid to the Competition and Markets Authority – putting another stumbling block in the way of the takeover. The deep ‘Phase 2’ investigation poses a major hurdle for the bid. 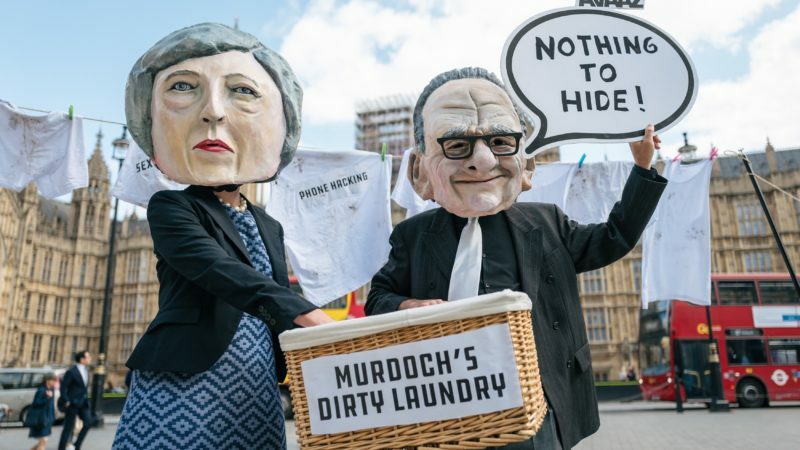 Today, Avaaz, the group which has led the charge against the move, has launched a legal challenge to Ofcom – the broadcasting regulator which declared a Fox-owned Sky ‘fit and proper’ last year. “1. Ofcom cleared Fox News, despite the overwhelming evidence put before it by Avaaz and others, of the deliberate gross bias and fake news the channel routinely broadcasts. 2. Ofcom made basic factual errors in assessing the sexual and racial harassment scandals at Fox and subsequently rewrote parts of its decision when Avaaz took the first step towards a legal challenge. Both the old and new versions show it failed to assess the efficacy of Fox’s corporate governance policies in stopping large-scale wrongdoing. 3. In an earlier Fit and Proper decision in 2012, Ofcom severely criticised James Murdoch’s conduct at News Corporation and found Sky fit to retain a licence only after noting that he had stepped down as chair of Sky. In its 2017 report, Ofcom failed to explain why it was content with James Murdoch’s role as CEO of a merged Fox/Sky, including his assurances on corporate governance. This latest challenge comes just two days after Fox News brought back Bill O’Reilly – the presenter fired in April this year after the New York Times revealed parent company 21st Century Fox paid millions of dollars over the years to settle claims of sexual harassment and other inappropriate behaviour made against him. He has denied all the claims – but advertisers fled the show over the news. The legal papers are on their way to Ofcom as we write – kicking off the next phase in this long-running battle.